The two African rhino species – black rhino and white rhino – have both increased in number in recent years thanks to successful conservation efforts, especially in South Africa. Indeed, the white rhino has been brought back from the brink of extinction. However, both species are again at risk due to a huge surge in poaching to meet demand for illegal rhino horn, primarily in Asia. 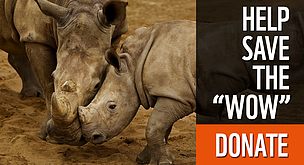 Countries and conservationists are stepping up their efforts but record numbers of rhinos are currently being killed. Just 150 years ago, Africa’s savannahs teemed with over a million black and white rhinos. But relentless hunting by European settlers saw rhino numbers and distribution quickly decline. 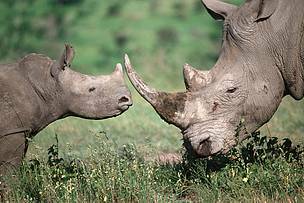 Poaching also escalated during the 1970s and 1980s as demand grew for rhino horn, a prized ingredient in traditional Asian medicines - leaving both species at risk. Thanks to vigorous conservation and anti-poaching efforts and an international ban on the trade in rhino horn, some African rhino populations are now stable or increasing. However, most of the continent's remaining rhinos are found in just four countries – South Africa, Namibia, Zimbabwe and Kenya. Very few African rhinos now survive outside of protected areas and sanctuaries. And poaching is again threatening the survival of some populations. Rhinos have been around for millions of years and play a crucial role in their ecosystem. They’re important grazers, consuming large amounts of vegetation, which helps shape the African landscape. This benefits other animals and keeps a healthy balance within the ecosystem. Local people also depend on the natural resources within rhino habitat for food, fuel and income. As one of Africa’s ‘big five’, rhinos are a popular sight for tourists. Ecotourism can be an important source of income for local people. By helping protect rhinos, we’re helping to conserve their habitat for the benefit of people and wildlife, helping support local communities and making sure natural resources are available for generations to come. The greatest threat facing African rhinos is poaching for the illegal trade in their horns, which has soared in recent years. The number of rhinos poached in South Africa alone has increased by 9,000% since 2007 - from 13 to a record 1,215 in 2014. Powdered horn is used in traditional Asian medicine as a supposed cure for a range of illnesses – from hangovers to fevers and even cancer. 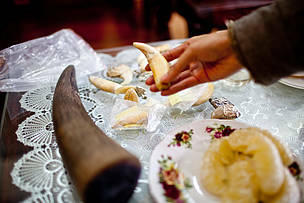 But the current surge has been primarily driven by demand for horn in Vietnam. 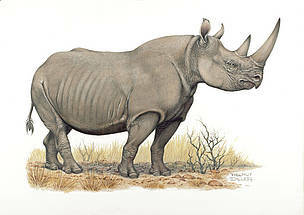 As well as its use in medicine, rhino horn is bought and consumed purely as a symbol of wealth. Poaching gangs use increasingly sophisticated methods, including helicopters and night vision equipment to track rhinos, and veterinary drugs to knock them out. This means countries and conservationists need to match this level of technology to be able to tackle the problem, alongside working to reduce demand. "The African rhino is under serious threat from international poaching syndicates which have intensified poaching driven by growing demand for horns in Asia." 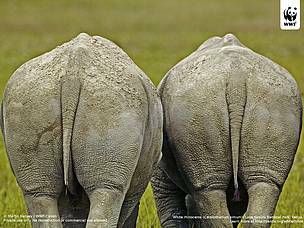 Despite their names, both the white rhino and black rhino are the same dark grey-brown colour. It’s thought that the name ‘white rhino’ is a misinterpretation of the Afrikaans word ‘wyd’, referring to its square upper lip. Black rhinos have hooked lips. Both species of these armoured giants are vegetarian and need to eat large amounts of food every day. Also called the hook-lipped rhino due to their prehensile upper lip, black rhinos are the smaller of the two African species. They were once found throughout sub-Saharan Africa, with the exception of the Congo Basin. They are now limited to protected areas in the east and south of the continent. 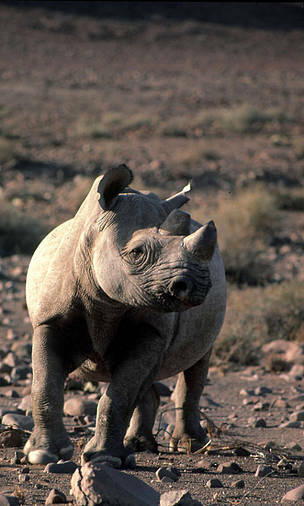 About 96% of black rhinos were lost to large-scale poaching between 1970 and 1992. But effective conservation efforts have seen the total number grow from 2,600 in 1997 to over 5,000 today. 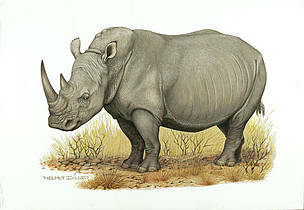 White rhinos are bigger than black rhinos and have a squared upper lip and almost no hair. While the species is bearing the brunt of the surge in poaching, it is one of conservation’s greatest success stories. Once thought to be extinct, a population of less than 100 was found in 1895 in South Africa. After more than a century of protection and management, the species now numbers over 20,000 and has been reclassified as Near Threatened. 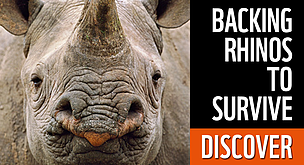 Supporting the translocation of rhinos to create new, secure populations. TRAFFIC is a joint programme of WWF and the World Conservation Union (IUCN) that monitors the global wildlife trade. TRAFFIC also works in close co-operation with CITES. The Convention on International Trade in Endangered Species (CITES) is an international agreement between governments, that aims to ensure that international trade in specimens of wild animals and plants does not threaten their survival and it accords varying degrees of protection to more than 33,000 species of animals and plants.